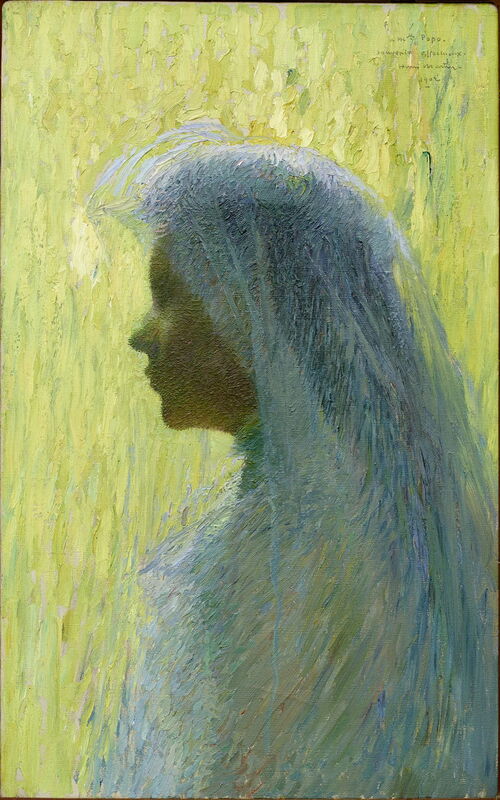 Henri-Jean Guillaume Martin (1860–1943), Profil au voile (Veiled Profile) (1902), oil, dimensions not known, Musée de Cahors Henri-Martin, Cahors, France. Wikimedia Commons. In the previous article, I showed examples of Henri Martin‘s paintings from the 1800s. Henri-Jean Guillaume Martin (1860–1943), Berger et ses trois muses (The Shepherd and His Three Muses) (1900), oil, dimensions not known, Musée de Cahors Henri-Martin, Cahors, France. Wikimedia Commons. The turn of the century was a particularly productive period for Martin. 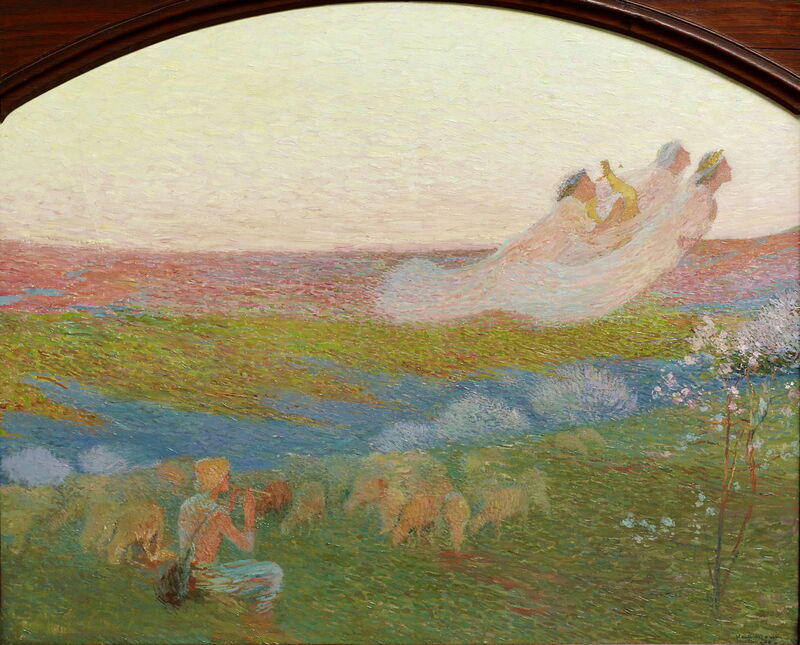 His The Shepherd and His Three Muses (1900) shows his unique combination of Symbolism, narrative painting, landscape, and Divisionism. 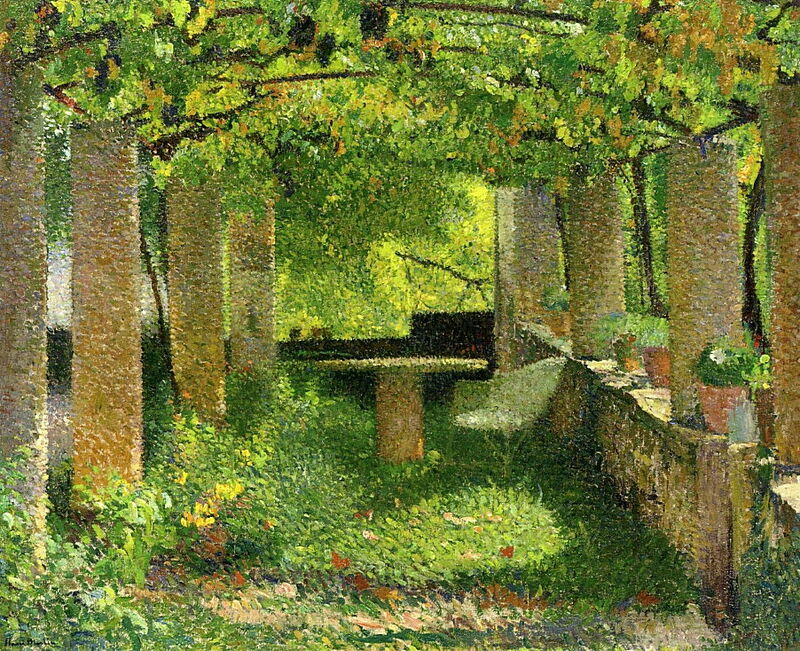 Henri-Jean Guillaume Martin (1860–1943), The Arbour (1900), oil on canvas, 72.7 x 90.2 cm, Private Collection. Wikimedia Commons. This modified ‘pointillism’ enabled the use of intense colour, as in his The Arbour (1900). Henri-Jean Guillaume Martin (1860–1943), Rêverie automnale (Autumn Dream) (1900), oil, dimensions not known, Musée de Cahors Henri-Martin, Cahors, France. Wikimedia Commons. 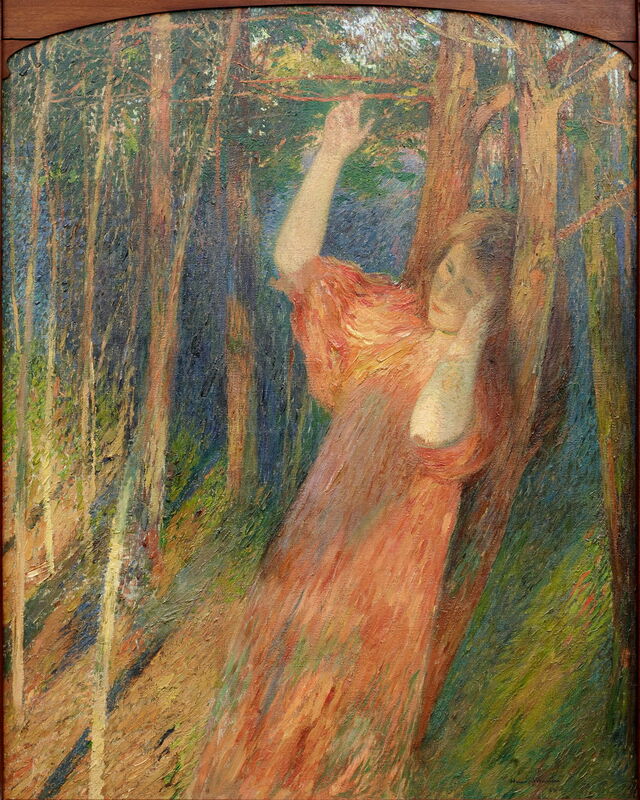 He uses longer brushstrokes in his Rêverie automnale (Autumn Dream) (1900) to model trees and the woman’s dress, merging them into continuous areas without any intervening ground. 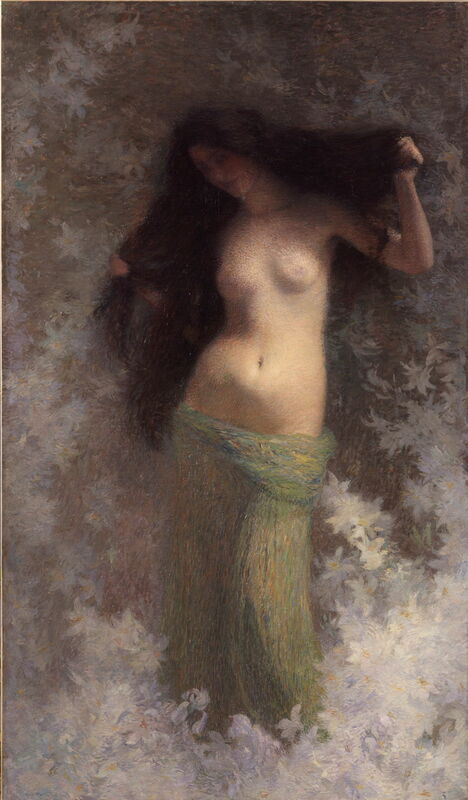 Henri-Jean Guillaume Martin (1860–1943), Beauté (Beauty) (1900), oil on canvas, 188 x 110 cm, Musée des Augustins, Toulouse, France. Wikimedia Commons. Beauty (1900) shows the contrasting facture used to depict hair, flesh, fabric, and flowers. 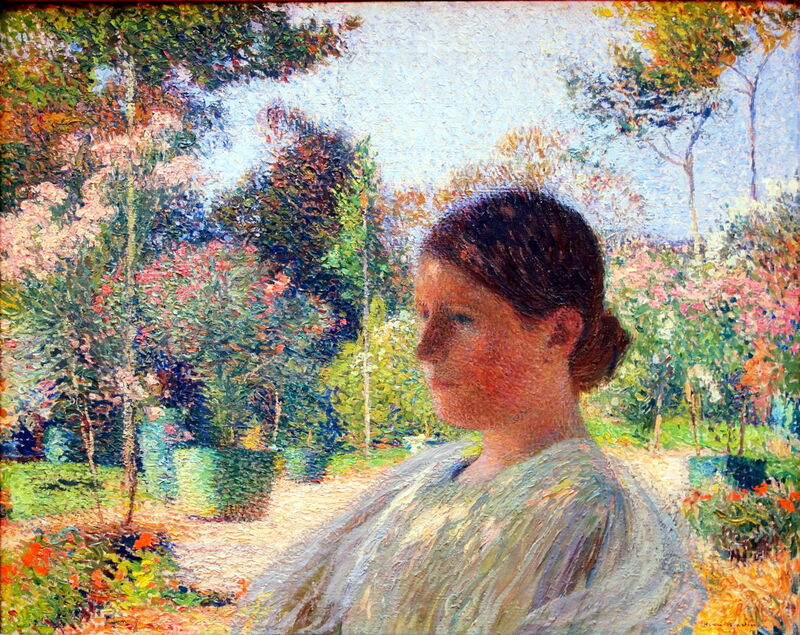 Henri-Jean Guillaume Martin (1860–1943), Dans le jardin (In The Garden) (c 1900), oil, dimensions not known, Palais des Beaux-Arts, Lille, France. Wikimedia Commons. Use of modern high-chroma pigments enabled the intense colours of In The Garden (c 1900). He won the Grand Prize at the 1900 Exposition Universelle in Paris. His startling Profil au voile (Veiled Profile) (1902) has very different textures in its different surfaces. In the early twentieth century, he received several commissions to paint large works for public buildings, including the Sorbonne in Paris (1908), City Hall in Paris, a room in the Élysée Palace (1908), and the French National Council of State Chamber (1914-22) in the Palais-Royal. The last are particularly impressive, and very difficult to photograph. 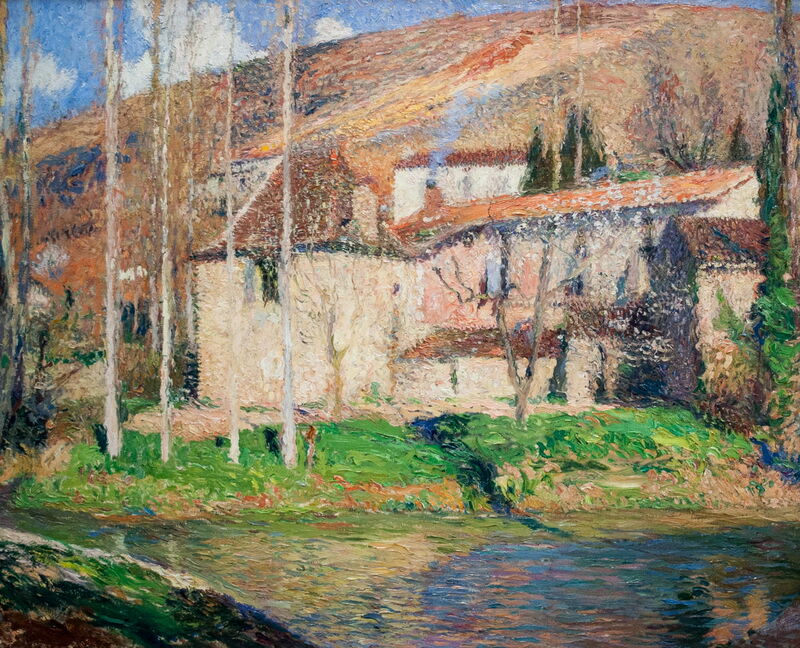 Henri-Jean Guillaume Martin (1860–1943), View of Labastide-du-Vert (1910), oil on canvas, dimensions not known, Museum voor Schone Kunsten, Gent, Belgium. Wikimedia Commons. He had already fallen in love with the deep countryside near the river Lot at Labastide-du-Vert, north of Toulouse in the southwest of France. Visits there resulted in landscapes such as his View of Labastide-du-Vert (1910). When the First World War broke out in 1914, he moved there from Paris, and there he remained for the next four years. 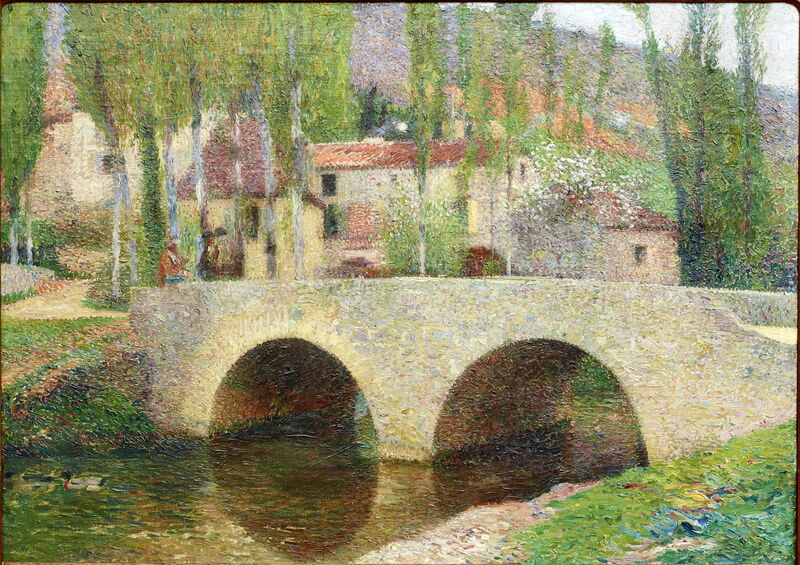 Henri-Jean Guillaume Martin (1860–1943), Le Pont à Labastide-du-Vert (The Bridge at Labastide-du-Vert) (c 1920), oil, dimensions not known, Musée de Cahors Henri-Martin, Cahors, France. Wikimedia Commons. Although he continued to paint in other genres still, in the period between the wars he painted many views of this area, including The Bridge at Labastide-du-Vert (c 1920). 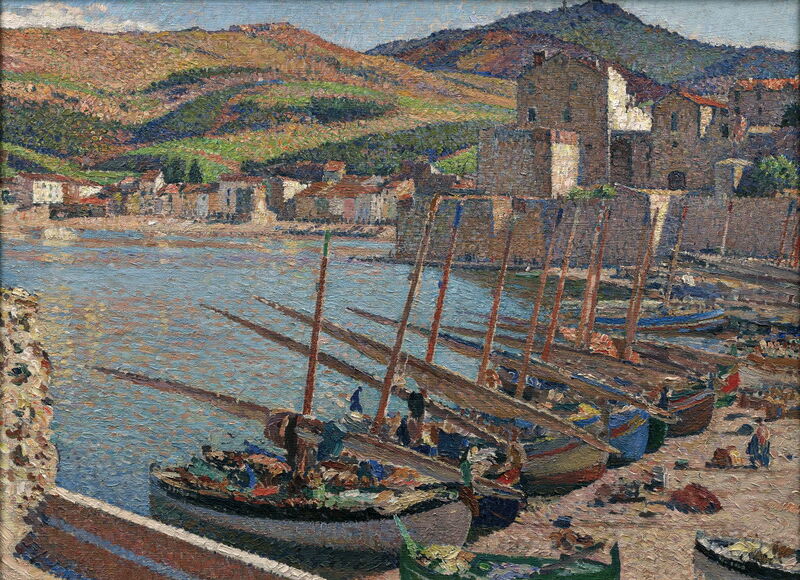 Henri-Jean Guillaume Martin (1860–1943), Barques à Collioure (Boats at Collioure) (c 1920), oil, dimensions not known, Musée de Cahors Henri-Martin, Cahors, France. Wikimedia Commons. He also travelled to the French Mediterranean coast near the Spanish border, where he painted Boats at Collioure (c 1920). Henri-Jean Guillaume Martin (1860–1943), Le Monument aux morts (The Memorial) (1932), oil, dimensions not known, Musée de Cahors Henri-Martin, Cahors, France. Wikimedia Commons. Probably the last of his major public commissions, The Memorial (1932) is a triptych with a single continuous scene, painted for the town of Cahors in southwest France. 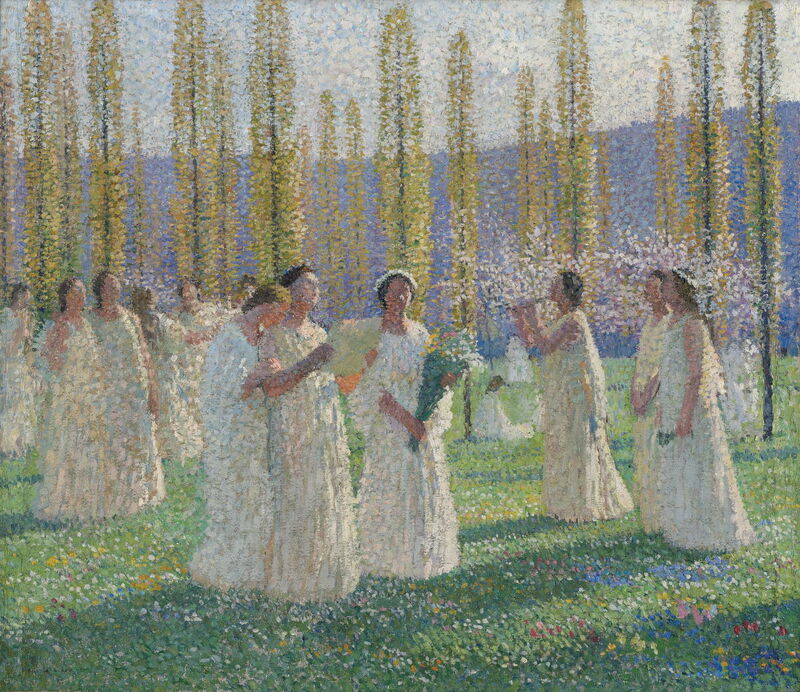 Henri-Jean Guillaume Martin (1860–1943), Etude pour les Champs Elysées (Study for Les Champs Elysées) (1939), oil, dimensions not known, Musée de Cahors Henri-Martin, Cahors, France. Wikimedia Commons. Study for Les Champs Elysées (1939) shows how he continued to use fine brushstrokes long after Neo-Impressionism had vanished. That same year, he finally retired to Labastide-du-Vert, where he died in 1943. The paintings of Henri Martin are a well-kept secret. Sometimes criticised for not being particularly innovative or original, I hope these examples have shown otherwise. I cannot understand why they are not much more widely known, and why art history seems to have forgotten Martin. The largest public collection is in the town of Cahors, with its superb mediaeval bridge, not far from Martin’s favourite Labastide-du-Vert. At the moment, the museum is closed for refurbishment. When it re-opens, I think it will be well worth a visit. Posted in General, Painting and tagged Martin, painting, Post-impressionism. Bookmark the permalink. Last week on my Mac: who remembers HyperCard, and a ban on encryption?